There’s more than meets the eye with the Moultrie M-990i, which plenty of experienced hunters often turn to. This is the ideal hunting ally when you want nothing less than a dependable game camera that is able to put out impressive video and photos for studying the game animals and their natural travel patterns. This model is made with a realistic camouflage design aptly described as Mossy Oak® Treestand®. The design ensures that you can hide the unit from view from the game, whether it’s tied to a tree or placed among the bushes for capturing images up close. It will easily blend into the surrounding environment so it can do its job without getting the deer spooked. Moreover, the camera comes with the advanced iNVISIBLE™ flash for illumination supplemented by the 940nm infrared LEDs so once it detects motion, it can snap photos without the startling flash that will scare the animals away. The reliable night flash is made powerful enough while remaining undetectable to the game so images are virtually at their most natural quality. Able to handle nearly any demanding condition, this trail camera is made tough for outdoor use. Classified as a game spy camera by the manufacturer, this model uses No Glow technology that makes it invisible to the eye so you can get a true picture with uncompromised image quality. The unit is solidly built so it can be left running outdoors to give you more than enough images to study the game.The unit is quite easy to use so you can optimize its functionality right out of the package. You can easily program the camera and review images thanks to the innovative preview screen. Lightweight at just 13.6 ounces, this camera allows easy transfer from site to site. Providing long running performance, this trail camera comes with a revolutionary 36-LED flash system that can detect motion from 50 feet away and up to a maximum of 70 feet out, so you won’t miss vital indicators of game activity on the site. Producing remarkable 10MP photos, the camera also comes out with 720p high-definition videos backed by sound no matter what day it is. You will be able to see details clearly for effortless differentiation. between images. The Illumi-Night sensor delivers bright and clear images during the nighttime. The cutting edge Motion Freeze ensures that fast movement will have less blur. The fast trigger speed is less than one second, so the camera starts taking photos nearly as soon as it detects motion within its frame. 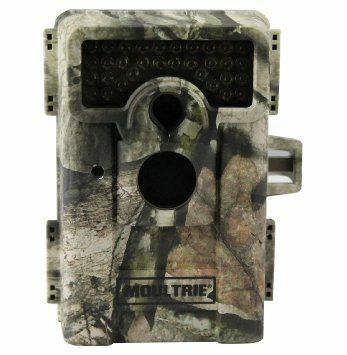 Measuring 5.75″ H x 4.7″ W x 3.75″ D, this trail camera is very easy to position on the site by attaching to a tree or concealing in the bushes, so it easily blends in while being able to do its job effectively. The SD memory card slot handles cards up to 32 GB memory so there’s always enough space to store captured photos and recorded videos. The Time Lapse mode lets the camera snap photos at predetermined intervals so you can collect footage for a full day integrated into just minutes. Thanks to Managed Memory capacity, the camera lets you obtain the most number of images possible. This camera comes with an easy interface secured by password protection, so images are for your personal viewing only. It has a 2-inch color TFT screen on which you can preview captured images and video while also allowing you to program the unit easily. Get hours of video footage and thousands of photos thanks to the lengthy battery life that supports up to 13,000 images using a set of 8 AA batteries. Each photo taken will have barometric pressure, time, temperature, date, moon phase and camera ID stamp for easy identification and study when monitoring the game. Able to take up to four photos every second thanks to FastFire Continuous Shooting, this camera enables you to select from four different operating modes, which include time-lapse plot camera, IR triggered plot game camera, plot camera by day/motion detection during the day and night, and as a camera for recording video. This enables you to choose the mode that best fits the application you will be doing. It also allows you to supplement photos with video footage so you can plan your hunts based on what you you see in images and video on how the game behaves, their typical behavior in that specific site, and their feeding and traveling habits, which lets you devise a good enough hunting scheme that will get you that trophy catch of the season.